Interior decoration of a house is incomplete without Roman blinds and Roller blinds. While both these are similar in many aspects they differ in so many other aspects.Roman blinds, usually made of silk or linen make the interiors stylish as well as adorned. Those who want to buy Roman blinds can select them from a wide range. Since they are made of thick fabric they ensure privacy as well as protection from sunlight. Roman blinds are usually used for bedrooms. Though roller blinds are also used in the interiors for blocking sunlight they are rather used in offices and other commercial places. Though used for the same purpose the applications Of Roller blinds and Roman blinds are quite different. Unlike Roman blinds, Roller blinds completely block the sunlight. Both these blinds are up and down rolling type. When there is a selection among both these blinds the customer should see whether the blinds are for a home or for an office. Roman blinds are available in different colours and texture so as to suit any decor. They make an elegant appearance. It is made of silk, linen or satin and is mounted on an aluminium track. These curtains are common in modern houses and they have a functional appearance. With the help of releasing cords the curtain can be raised or lowered. They hang flat when lowered and they require very little of the fabric. Roman blinds can be custom made so as to fit the windows perfectly. He latest types of Roman blinds are made of best quality fabric with durable head rail made of aluminium. There are various online shops that offer a wide choice of Roman blind fabrics. Matching to any décor or colour these shops offer a fabric. Customers can choose the type of fabric and colour and provide the measurements of their windows to these shops so that they will arrange to deliver the custom made Roman blinds. Roller blinds are available in a variety of fabrics that are much durable. Hey are available in different styles also. 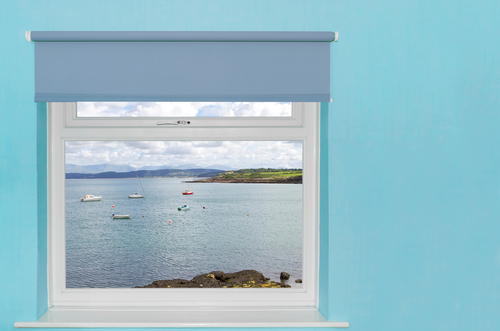 The additional options for Roller blinds include dual blinds, chain drive, head boxes and side channels etc. Roller blinds are available in different styles and finishes. Roller blinds are available for bed room, bath room and kitchen. They are made moisture resistant. Roller blinds fit discreetly with the frame of the windows and provide a practical look. Roller blinds ensure privacy. Roller blinds are easy to install and are available in a wide range. The installation process is similar for both Roman blinds and Roller blinds. Both types of blinds require a single rod and the tube can be fastened so as to suit the window frame. Though look fragile Roman blinds are actually tough. Roller blinds are more affordable and they can also be custom made. When the blinds are in white colour they can reduce heat. In offices the blinds can reduce the amount of glare so that it will be comfortable for those who work with a computer. Blinds can be cleaned easily while curtains are to be washed. Roller blinds are usually used in work places because it gives a lot of comfort to the people within the work place. These shutters are easy to set up and can be fixed on the windows quite quickly and also quickly.